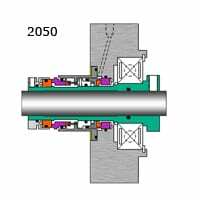 The 2050 is a specifically engineered dual cartridge seal for use in mixing and agitating equipment. Designed as a true mixer seal, the FSI 2050 addresses the unique problems encountered in sealing mixers. “Double balanced inboard seal” gives the inboard seal pressure reversal capabilities and allows 2050 to perform as specified during off-design operation and possible upset conditions. Available external lip seal to contain and direct leakage to a safe location. Run Out .125”/3mm Radial F.I.M. Elastomers: All commercially available elastomers as specified. Sizes: 1.50” to 12.00” Available in both inch and metric sizes.